Quick – write this down. The A.T. Cross Company has the finest selection of high-quality pens, pencils, planners, journals, and personal accessories. Jot down a Cross.com coupon code and take note of how much you save on your order! Every writer knows the value of a good pen. Whether you’re recalling adventures in your journal or signing a big deal, A.T. Cross has the perfect writing instrument for you. Select from luxury rollerball, ballpoint, and fountain pens or purchase a complete set. Stand out with a sturdy gold pen engraved with your name or give one as a gift to share the inspiration. Be warned, you’ll love their pens and pencils so much, your keyboard may get jealous. A pen wouldn’t be complete without paper. That’s why A.T. Cross carries an extensive collection of stylish planners and journals to keep you organized. When you’re filling up the pages, head back to Cross.com and pick up an ink refill to keep you going. A.T. Cross has everything you need to get business done in style. Step into the boardroom with one of their signature watches around your wrist and add a touch of flare with some lavish cufflinks. They design and sell wallets, reading glasses, and other accessories. A.T. Cross Company has been manufacturing writing tools for more than 166 years. Richard Cross founded the company in 1846 – the same year the sewing machine was invented! Cross utilized his skills as a pen and pencil maker to build the companies reputation. Today, A.T. Cross Company is publicly traded on the New York Stock exchange, but they retain their roots in the Lincoln, Rhode Island community where it all started. Whatever you order, be sure to take note of a chance to save big. Take advantage of a Cross.com coupon code to ink a great deal. Communication is essential, even if it is done the "old school" way with a pen. Use a Cross.com coupon code to save money when buying all of your essential communication tools. Below are instructions on how to apply the Cross.com coupon code. 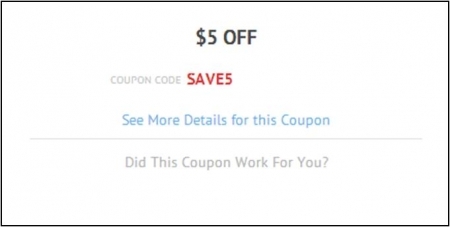 After locating the coupon or deal you want to use to purchase Cross.com items, click the corresponding "Get Code" or "View Deal" button on the Couponpal Website. A new window will pop open when you click on your button. 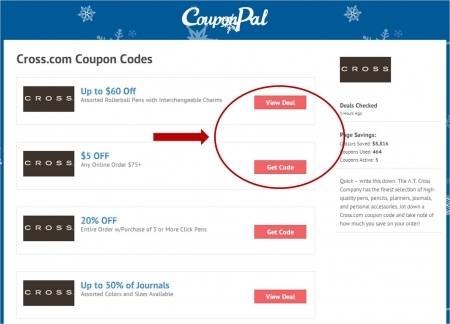 If Couponpal is providing you with a Cross.com coupon code, copy and paste from the pop up window. Keep this window open in case you need to come back to it later. 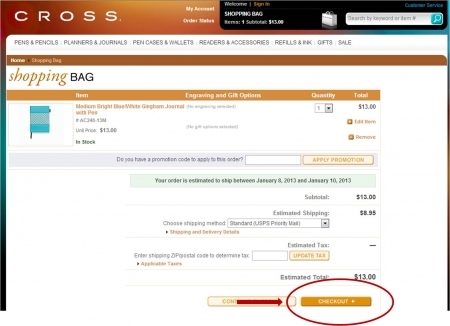 If there is no Cross.com coupon code, you will skip this step. After clicking the Couponpal "Get Code" button, your webpage will change to to cross.com. If you clicked the Couponpal "View Deal" button, a new window will pop open. It also will direct you to usa.kaspersky.com. "View Deal" means there is no Cross.com coupon code and your promotion will automatically be applied when you click this link. 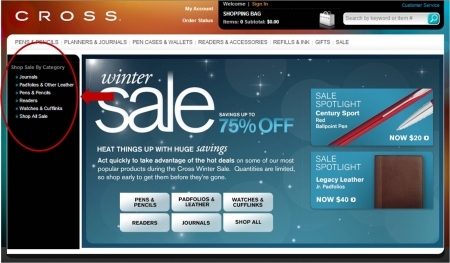 You can now choose the category of Cross.com products you want to purchase such as journals, padfolios, pens, pencils, readers, watches, cufflinks, and sale items. 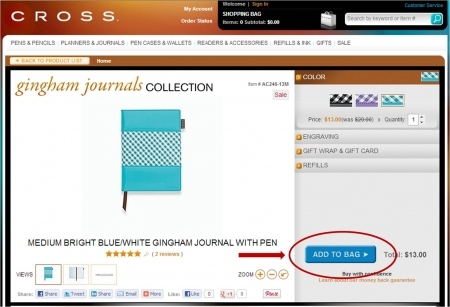 After locating the Cross.com items you wish to purchase, select any options such as color, engraving, gift wrap, gift card, and refills. Then, click "Add to Bag." Review the items in your Cross.com shopping bag. Then, if you have one, enter your Cross.com coupon code in the box and click "Apply Promotion." Choose your shipping method then enter your zip code to calculate any sales tax. To finalize purchase, click "Checkout." If you think all pens are created equal, think again. A few strokes with a fine writing instrument is all it takes to tell the difference between custom-made quality and off-the-shelf, mass produced. With this in mind, we decided to choose our 3 favorite pens from the fine scribe enablers at Cross. See what you think and then treat yourself or someone else to one, using a coupon code, of course. For variety’s sake, we picked one each from their different pen types: Ballpoint, Rollerball, and Fountain. Here they are. First off, it gets big points for being multi-function – three birds, one stone. It comes with three top selections: black ballpoint, red ballpoint, and pencil. You switch from one to another with a simple twist. Very smooth writing action with nice solid lines. We liked that we could quickly move from black to red to indicated revisions, edits, or emphasis. The ink cartridges and pencil lead were very easy to replace and this model is available in various colors and finishes. 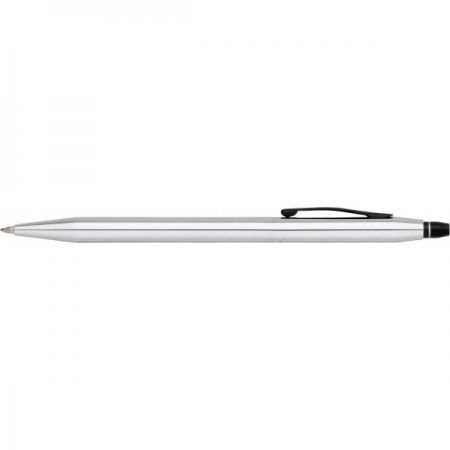 This one is probably the most popular and recognizable pen from Cross. However with this latest edition, they’ve gone from a “twist” to a “click” to expose the rollerball. To us, a “click” is more satisfying, saying “Okay, time to get to work.” It’s very slender yet has some weight to it. It uses a gel ink refill and we found that the ink flows smoothly and dried almost immediately, preventing smudging. Now this one creates a truly a luxurious writing experience. 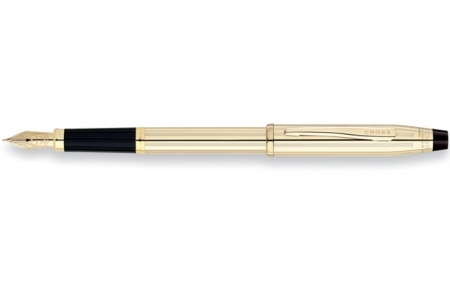 The exterior finish is 10-karat gold, the appointments are 23-karat gold-plated, and the nib is solid 18-karat gold. Kind of the “gold standard” among pens, if you will. The ink flowed smoothly, never too much or too little, and dried very quickly. It comes with two black fountain pen cartridges and we recommend getting the optional converter that allows you to fill it from bottled ink as well. If you’re going to go with a fountain pen, you gotta use an ink bottle. Très chic, this one. The best part about researching this article is that we all ended up with really nice pens. There’s even a bit of a “who has the coolest pen” competition going on now. We all find it wise to let the big boss think his is the best.